Macworld sent in a team of specially trained spies to uncover Tiger’s deepest, darkest secrets. Our third installment deals with Preview. Tiger’s viewer application can do more than just perform basic tasks. 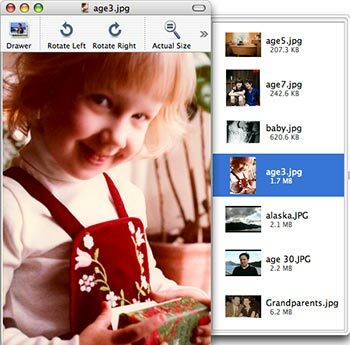 It can also edit images, capture screenshots, display folder images and much more. In previous versions of OS X, if you wanted to look at all the images in a folder, you had to open the folder, select all the images, and then drag and drop them onto Preview’s icon in the Finder or the Dock. In Tiger, a subtle change has made this process much easier. You can drag and drop a folder onto Preview’s icon—just hold down Command-option while you drag (this command forces any program to try to open anything you drop on it). You can drop the folder onto any Preview icon, whether it’s in the Dock, the Finder’s toolbar or sidebar, or even the Finder itself. When you drop the folder, Preview opens a new window containing all the images inside it—the drawer displays a thumbnail for each one. Each PDF file, however, opens in its own window. A Different View Preview usually sorts the photos in its drawer alphabetically. But by choosing a different criterion from the contextual menu, you can change the sort order—here, images are sorted by file size—and display additional information about the files. Hey, That’s Not Photoshop! 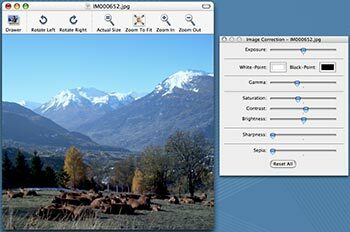 Try Preview’s image-correction tools when you need to make a quick graphics fix.